Lemuel Shaw (January 9, 1781 – March 30, 1861) was an American jurist who served as Chief Justice of the Massachusetts Supreme Judicial Court (1830–1860). Prior to his appointment he also served for several years in the Massachusetts House of Representatives and as a state senator. In 1847 Shaw became the father-in-law of author Herman Melville. Shaw was born in West Barnstable, Massachusetts, the second son of Oakes Shaw and his second wife Susanna, who was a daughter of John H. Hayward of Braintree. The Shaws were descendants of Abraham Shaw (January 2, 1590 – November 2, 1638), who left Halifax, England in 1636 and settled in Dedham. Oakes Shaw, a Congregationalist minister, was pastor of the West Church in Barnstable for forty-seven years. Lemuel was named for his uncle, Dr. Hayward of Boston, father of George Hayward, the surgeon. Educated at home by his father except for a few months at Braintree, he entered Harvard in 1796. There, he taught school in winter vacations. After graduating with high honors in 1800, he taught for a year in a Boston public school, and wrote articles and read proof for the Boston Gazette, a Federalist newspaper. In August 1801, he began studying law in Boston under David Everett. Meanwhile, he learned French proficiently from a refugee, Antoine Jay, afterwards a founder in France of the liberal newspaper Le Constitutionnel. In 1802, he moved with Everett to Amherst, New Hampshire, where besides doing legal work he contributed a poem on dancing and translations from French to the Farmers' Cabinet, a local newspaper. He became engaged to Nancy Melvill, daughter of Maj. Thomas Melvill of Boston (the subject of Oliver Wendell Holmes Sr.'s poem "The Last Leaf") but she died soon afterward. Admitted to the bar in Hillsborough County, New Hampshire, in September 1804, and in Plymouth County, Massachusetts that November, Shaw began practice in Boston. When his associate left Boston after being acquitted of murder in a political quarrel, he practiced alone for fifteen years. In about 1822, Shaw took Sidney Bartlett, an able trial lawyer, as his junior partner. His practice gradually became large, but he was less known as an advocate than as the adviser of important commercial enterprises. Shaw was prepared for his judicial career by numerous public positions. He was elected a member of the Massachusetts House of Representatives, serving in 1811-14, 1820 and 1829, and as a state senator in 1821-22. He served as a member of the constitutional convention of 1820. He also held many offices in Boston. Shaw was elected a Fellow of the American Academy of Arts and Sciences in 1823. In 1822, with few precedents to guide him, he drafted the first charter of the city, which lasted until 1913. On the death of Chief State Justice Isaac Parker, Governor Levi Lincoln offered Shaw the appointment. Daniel Webster successfully urged Shaw to accept, though it meant giving up a practice of $15,000 to $20,000 a year for a salary of $3,500. And for this, if nothing else, Webster later thought the public owed him a debt of gratitude. Shaw's commission was issued August 30, 1830, and he served 30 years, resigning August 21, 1860. His exceptionally long judicial career coincided with the development of many important industries, so that he made law on such matters as water power, railroads and other public utilities. Probably no other state judge has so deeply influenced commercial and constitutional law throughout the nation. His skill in expounding the fellow-servant rule considerably delayed the replacement of that rule by workmen's compensation. An opinion by Shaw rarely lends itself to isolated quotations; its strength lies in the entire solidity of its reasoning. "His words had weight rather than brilliancy or eloquence", and his greatness came from his personality as well as from his intellectual powers. He was no mere writer of opinions, but preeminently a magistrate. In Shaw's time, the chief justice sat often at trials. In such work he was thorough, systematic, and patient, with a remarkable power to charge juries so that they understood the exact questions before them. Among his cases that excited great public interest were the trial in 1834 of the anti-Catholic rioters who destroyed the Ursuline convent in Charlestown (Commonwealth v. Buzzell). In 1836 his court ruled in Commonwealth v. Aves that a slave brought voluntarily into Massachusetts, a free state, was a "sojourner," or a journeyer, and not taking domicile in that state. Therefore, slaves could be brought into the state only for a limited time. Abolitionists, who had brought the habeas corpus suit, wanted a rule which would have freed the girl, while southern defenders of the practice wanted the court to uphold the concept of comity and acknowledge the legality of slavery. Shaw attempted to split the decision by applying the archaic "sojourner" status to slaves. Further, he rejected the idea that comity must be applied. In its strict understanding comity is a vehicle for facilitating trade and amicable interactions between jurisdictions and this does not fit this factual situation as a state or jurisdiction is not required to honor comity if in doing so it is sanctioning practices repugnant to the state's own norms. This caused an uproar in the South where planters accused the Northerners of denying their equal sovereign status. Because of Boston's strong abolitionist stand, Shaw continued to oversee cases related to slave law and race. His ruling in favor of the constitutionality of school segregation in Roberts v. City of Boston (1849) established "separate but equal" as a legal doctrine in the state. In another case, he again refused to release a fugitive slave (Thomas Sims) on habeas corpus grounds, as he felt bound by the Constitution and the law, as the recent Fugitive Slave Act of 1850 required states and local governments to cooperate in the capture of escaped slaves. Other cases that were socially notable were the 1847 divorce case of Henry Cobb against his wife Augusta Adams Cobb, for joining the Mormons and eventually marrying Brigham Young in a polygamous marriage (Cobb v. Cobb); and that in 1850 of Professor John White Webster for murdering George Parkman (Commonwealth v. Webster). Shaw's work in extending the equity, jurisdiction, and powers of the court was especially important. He was largely instrumental in defeating an attempt in 1843 to make a reduction of salary apply to judges already in office and an attempt by the Massachusetts Constitutional Convention of 1853 to abolish the life term of judges. His opinion in Cary v. Daniels (8 Metcalf) was an important legal precedent in Massachusetts regarding the regulation of water power rights belonging to riparian proprietors. In Commonwealth v. Hunt (1842), Shaw provided an important precedent in labor relations by arguing that members of labor unions were not engaging in criminal conspiracies against their employers. His decision in Commonwealth v. Alger (1851) was an early and influential attempt to define the limits of state police power. In Brown v. Kendall (1850), Shaw established negligence as the dominant standard of tort law, and ruled that injured plaintiffs have the burden of proving that the defendant was negligent. Widely read in English literature, he was also attracted by new mechanical processes and was a member of many learned and charitable societies. He was a fellow of Harvard College from 1834 until his death, and an overseer from 1831 to 1853, two offices rarely united. Shaw was elected a member of the American Antiquarian Society in 1855. In politics he was a Federalist and a Webster Whig, but remained all his life a free-trader. He attended Unitarian services, though he was never a communicant. Fond of entertaining and dining out, he was simple and affectionate in his home life, his interest in the social events of his household extending to the minutest details. After his resignation from the bench, his health failed, and he died within a few months. He was buried in Mount Auburn Cemetery. In March 2018, Shaw was identified as the unknown justice depicted in a portrait displayed outside the chief justice's chambers of the Supreme Judicial Court in Boston. The Court had appealed to the public for help in identifying the person in the painting, and received over 40 responses, with ten people naming Shaw. The tipping point came when a doctoral candidate at the University of Michigan, Ann Arbor, a Shaw scholar, provided research.A court officer subsequently found the initials "LS" on a wood panel attached to the canvas. During his tenure as Chief Justice, Shaw is reported to have heard between 2,000 and 2,200 cases. 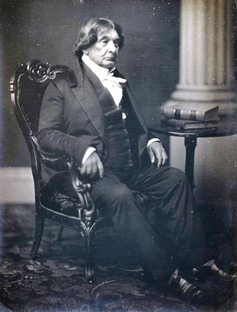 Shaw presided over several cases that would help shape American law and jurisprudence including the case of Washington Goode, a black seaman convicted on circumstantial evidence of murdering a fellow black mariner in 1849 Boston. Just seven months after Goode's execution, another murder captured Boston's attention and was also presided over by Shaw. No single case, brought him such criticism or such respect as the Parkman–Webster murder case, i.e. Commonwealth v. Webster, held in Boston in March 1850. While Shaw was Chief Justice, the Supreme Judicial Court still possessed exclusive jurisdiction over all capital crimes: capital cases were tried by a jury presided over by the Chief Justice attended by his associate justices. At such a trial all points of law were argued fully by counsel and settled on the spot by decisions as 'final and conclusive' as those of the highest appellate court on a bill of exceptions. Such an accommodation was rooted in the consideration that the defendant and the public had a unique interest in securing, in the first instance, a verdict based on correct and authoritative rulings and, therefore, in avoiding repeated trials. The trial lasted eleven days with the court sitting from nine in the morning until seven in the evening with a lunch break of one and one-half hours. Joel Parker, a professor at Harvard Law School and former Chief Justice of New Hampshire, 1838 to 1848, noted that "the trial, in the course of its progress, was a cause of extreme excitement, extending through the whole length and breadth of the land, and reaching even into foreign countries." On March 30, after the defense's closing remarks were concluded, after the prosecution's closing remarks lasting nearly five hours and after a brief un-sworn statement by the defendant himself, Chief Justice Shaw delivered a three hours long charge to the jury. Frederick Hathaway Chase in his 1918 biography of Shaw wrote: "Probably no charge ever delivered in this country has been followed as a precedent so frequently and so closely as this memorable effort. With the dignity of expression and the clearness of thought and language ... he expounded the law of homicide in terms which have been followed closely in nearly every murder trial from that day to this." In his charge to the jury, sometimes referred to as "the Webster charge", Shaw reviewed and/or refuted portions of the testimony heard and, in turn, defined murder, manslaughter, circumstantial evidence and reasonable doubt. Chase notes that regarding Shaw's review of the evidence presented that "it must be remembered that at the time when this case was tried there was no statute forbidding the court to charge upon the facts. It was within the power of the court at that time, as it is not now, to express an opinion as to the weight of evidence." It seems scarcely credible that Judge Shaw could have given utterance to the language published in his "charge to the jury." From the beginning to the end it is but an argument against the prisoner. An argument with all the moral force of a dictation to the jury, a dictation which makes a pretended trial by twelve men a mockery and a farce. ... What ulterior purpose was to be accomplished or what feeling of interest or resentment was to be gratified by such an extraordinary judicial usurpation as this we do not pretend even to conjecture; but we do not hesitate to declare that to find a parallel for such an unscrupulous prostitution of dignity, such an unblushing betrayal of the judicial office, we must go back to the days of Jeffreys. The definition of murder as stated by Shaw was "the killing of any person in the peace of the Commonwealth, with malice aforethought, either express or implied by law." Malice, as defined by the Chief Justice, included "not only anger, hatred and revenge, but every other unlawful and unjustifiable motive." Manslaughter was defined by Shaw as "the unlawful killing of another without malice". The distinction, as Leonard Williams Levy notes, is "..no small matter, particularly to the accused whose life is at stake. The existence of malice distinguishes murder from manslaughter, and manslaughter, the unlawful killing of a human being without malice, does not carry the death penalty." Having made the distinction in the law between murder and manslaughter, Shaw then argued, "Upon this subject, the rule as deduced from the authorities is, that the implication of malice arises in every case of intentional homicide; and, the fact of killing being first proved, all the circumstances of accident, necessity, or infirmity, are to be satisfactorily established by the party charged, unless they arise out of the evidence produced against him to prove the homicide, and the circumstances attending it." While this would appear to be contrary to the principle of "innocent until proven guilty," Shaw's charge to the jury has been interpreted to mean that if the prosecution's evidence proves that a life was taken and does not produce any evidence of extenuating circumstances, the law will imply that malice existed. It then, and only then, becomes the defense's burden to show extenuating circumstances. This case is to be proved, if proved at all, by circumstantial evidence; because it is not suggested that any direct evidence can be given, or that any witness can be called to give direct testimony upon the main fact of the killing. It becomes important, therefore, to state what circumstantial evidence is; to point out the distinction between that and positive or direct evidence; and to give you some idea of the mode in which a judicial investigation is to be pursued by the aid of circumstantial evidence. The distinction, then, between direct and circumstantial evidence, is this. Direct or positive evidence is when a witness can be called to testify to the precise fact which is the subject of the issue in trial; that is, in a case of homicide, that the party accused did cause the death of the deceased. Whatever may be the kind or force of the evidence, this is the fact to be proved. ... Circumstantial evidence, therefore, is founded on experience and observed facts and coincidences, establishing a connection between the known and proved facts and the fact sought to be proved. The advantages are, that, as the evidence commonly comes from several witnesses and different sources, a chain of circumstances is less likely to be falsely prepared and arranged, and falsehood and perjury are more likely to be detected and fail of their purpose. The evidence must establish the corpus delicti, as it is termed, or the offence committed as charged; and, in case of homicide, must not only prove a death by violence, but must, to a reasonable extent, exclude the hypothesis of suicide, and a death by the act of any other person. This is to be proved beyond reasonable doubt. Then, what is reasonable doubt? It is a term often used, probably pretty well understood, but not easily defined. It is not mere possible doubt; because everything relating to human affairs and depending on moral evidence is open to some possible or imaginary doubt. It is that state of the case, which, after the entire comparison and consideration of all the evidence, leaves the minds of jurors in that condition that they cannot say they feel an abiding conviction, to a moral certainty, of the truth of the charge. The burden of proof is upon the prosecutor. Sullivan makes the case in his book that Shaw overstepped his judicial bounds in his charge to the jury. Sullivan cites "Starkie, McNally, and Roscoe, the leading authorities upon the law of criminal evidence in 1850" and notes that they "made it quite clear that the fact of the corpus delicti, or the commission of the homicide, had to be proven by direct evidence to an absolute certainty, or beyond the least doubt. After this had been established absolutely, then the burden of proof was on the prosecution to show that the defendant had committed the crime beyond a reasonable doubt." "In his charge, however," Sullivan notes that "Shaw set a new standard for the degree of proof required to show the commission of the homicide. He stated that the corpus delicti was to be proved "beyond a reasonable doubt" only, and then the guilt of the accused "beyond a reasonable doubt" also. He further instructed the jury that the corpus delicti could be established beyond a reasonable doubt by circumstantial evidence alone." The case against Webster was one of the first capital cases to be won by the prosecution without absolute evidence that the victim had been murdered. On January 6, 1818, Shaw married Elizabeth Knapp, daughter of Josiah Knapp of Boston. She died in 1822, leaving a son and a daughter, Elizabeth, who became the wife of author Herman Melville. (He was the nephew of Shaw's former fiancée and in 1847, the year of his marriage to Elizabeth, Melville dedicated his Polynesian novel, Typee, to Lemuel Shaw). On August 29, 1827, Shaw married Hope Savage, daughter of Dr. Samuel Savage of Barnstable; they had two sons. ^ "Book of Members, 1780–2010: Chapter S" (PDF). American Academy of Arts and Sciences. Retrieved September 9, 2016. ^ Richer, Alanna Durkin (March 29, 2018). "Solved: Portrait of mystery Mass. high court justice identified". Boston.com. AP. Retrieved March 29, 2018. ^ Norton, Michael P. (March 29, 2018). "Judge in mystery portrait was chief justice for 30 years". The MetroWest Daily News. State House News Service. Retrieved March 29, 2018. Dictionary of American Biography, vol. 17, pp. 42-3. New York, Charles Scribner's Sons, 1935. Frederic Hathaway Chase, Lemuel Shaw: Chief Justice of the Supreme Judicial Court of Massachusetts. Boston and New York, Houghton Mifflin, 1918. Sketches by Samuel S. Shaw and P. Emory Aldrich in vol. iv., pp. 200-247, of Memorial Biographies of the New England Historic Genealogical Society (Boston, 1885). Leonard W. Levy, The Law of the Commonwealth and Chief Justice Shaw. Cambridge, Mass., Harvard University Press, 1957. Joel Parker, "The Law of Homicide"in The North American Review, Vol. LXXII, Jan. 1851, Boston, Charles C. Little and James Brown, p. 178-204. Robert Sullivan, The Disappearance of Dr. Parkman. Boston and Toronto, Little, Brown and Co., 1971. Chisholm, Hugh, ed. (1911). "Shaw, Lemuel" . Encyclopædia Britannica (11th ed.). Cambridge University Press. "(death notice)". The New York Times. April 2, 1861. p. 5 – via newspapers.com. "Sketch of the Late Chief Justice Shaw, of Massachusetts". Cincinnati Daily Press. April 4, 1861. p. 4 – via newspapers.com. Wikimedia Commons has media related to Lemuel Shaw. "Shaw, Lemuel" . New International Encyclopedia. 1905.